By now we’ve all hearda bout Amazon’s new locker service. Amazon Lockers is a system of lockers at public locations that Amazon customers can use for picking up their packages in a safe, secure and more private area. These lockers are a great idea for people who aren’t home and can’t get home for a daily delivery, and also can’t get personal deliveries at work. They’re also great for those of us that shop for nosy kids and spouses around the holidays. Of course you can read between the lines for other reasons that you may not want your Amazon shipments going to your house. 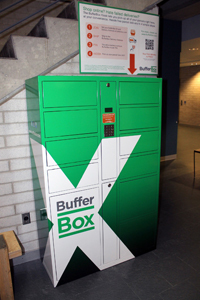 A Canadian startup called BufferBox, actually had the idea a year earlier. The difference between BufferBox and the Amazon Lockers though, is that online e-commerce channels outside of Amazon can use the service. We got a chance to talk with McCauley ourselves about the service that could easily be utilized by the other 70% of the e-commerce industry. The BufferBox service leverages innovative self-serve kiosks allowing e-retailers to ship items to customers through specified self-serve kiosks. The BufferBox kiosks are conveniently located at supermarkets, convenience stores, and transit stops, where pickup is available 24hrs/day. E-retailers are able to gain control over the customer interaction phase of the transaction. Currently, shipping carriers leave the last impression with customers; leaving the e-retailer to blame when problems occur. For e-retailers that have integrated with our network of kiosks using our API – an online buyer can select the BufferBox as a shipping option on the checkout page. For e retailers we have not integrated with, users can sign-up at bufferbox.com and will receive a personal BufferBox shipping address that they can use to ship their online purchases to. BufferBox users receive a unique, one-time use PIN code as soon as their parcel is ready for pick-up. They simply enter their PIN code at the BufferBox and the corresponding compartment will open for the user to retrieve their package. Jay Shah is driven by seeing ideas come to life and has had previous experience in running a successful start-up. Jay has a passion for agile development, enabling for fast and efficient R&D cycles, an aspect that is critical for the company’s early success. Jay is a Mechatronics Engineering graduate from the University of Waterloo and has previous startup experience at PharmaTrust in Business Analysis and Product Engineering, as well as with Clearpath Robotics in Product Management and Design. Jay loves Star Wars and all things tech! Mike McCauley’s previous work experience with Cypress Semiconductor as well as Research In Motion in Product Management and Product Marketing roles provides him with valuable skills for the company’s business development and external relations roles. His presence and social aptitude in forging meaningful and long lasting relationships with key contacts is a tremendous asset to the company. He is a Mechatronics Engineering graduate from the University of Waterloo. Mike is a master at Settlers of Catan and is a tea-connoisseur. Aditya Bali has had a variety of technical positions ranging from high-tech startups to large automation firms. His core competencies are electromechanical design and automation controls software. Aditya takes care of BufferBox’s mechanical design and contributes to the company’s marketing efforts. Aditya has previous experience at Automation Tooling Systems Inc. and PharmaTrust in Mechanical Design. Aditya was classmates with both Mike and Jay, graduating from the Mechatronics Engineering program at the University of Waterloo. He has worked with a variety of customers and understands how to effectively translate customer needs to high quality turnkey solutions – a definite asset for BufferBox. He loves music, especially going to concerts, and is a force to be reckoned with on the squash court. BufferBox currently operates out of Kitchener, Ontario in the Communitech Hub and we have an office in Mountain View, California. The atmosphere that has been created in Waterloo Region and within Communitech is phenomenal and we love being a part of it. Being able to reach out to the vast network of experienced and talented mentors and advisors along with being a part of a close group of entrepreneurs that are open, welcoming, and supportive is an incredible advantage to being a startup in the Waterloo Region. It has been nicknamed the start-up capital of Canada! How did you come up with the idea for BufferBox? Personal frustration. We are dedicated to solving this problem because it is a personal problem that we(and many other people) experience. Consumers are increasingly going online to make purchases and as this trend continues, we know the problem of not being at home when deliveries are made will become more of an issue. There was a need to create a company name for a business competition and BufferBox became the chosen one! The idea behind it is that the ‘box’ itself is meant to be a Buffer between you receiving your parcel and the retailer you purchased from. What problem does BufferBox solve? You experience this all too often – coming home to see a failed delivery notice on your door or your precious package left sitting in plain sight at your doorstep. Online shopping is supposed to be cost effective and time saving but parcel delivery makes it anything but that. BufferBox makes rage-inspiring missed deliveries a thing of the past. Ship your goodies to our network of self-serve parcel delivery kiosks and enter the PIN code you are emailed at the kiosk at your convenience. A door will then magically pop open with your package. Failed parcel deliveries are becoming more common as dual-income households become more prevalent. Package security is another major concern we frequently hear from consumers. The last-mile of delivery is very costly to the logistics industry, and really, these costs are shifted to e-retailers. By introducing an entirely new model for parcel delivery, we hope we can rid the world of failed parcel deliveries and introduce some much needed innovation to the logistics industry as it currently operates. There are three critical ingredients to BufferBox’s secret sauce! The first being our open platform, carrier agnostic service – a similar product exists in Europe and North America, however none of them offer an open platform for all carriers. Our e-retailer network that offers the BufferBox as a shipping option using the BufferBox retailer API is the second critical component. And the last is critical to all secret sauces, Thousand Island Dressing. A dilemma we faced in the initial stages of the startup process was deciding on the exact application we wanted to use the BufferBox for. There are endless possibilities (and ideas flowing in from others) about how best to use the BufferBox. These endless possibilities are ones we keep in our back pocket for future exploration, but ultimately, we chose the model we are currently working on, offering the service to consumers through their favourite online e-retailers. This is what we’re most passionate about solving and believe will have the most impact. A challenge we’ve overcome (if we haven’t overcome it yet, we’re getting very close) is growing the team in a short period of time to continue with scaling. Coming out of YCombinator we have a lot in the works and needed more hands on deck. We’re lucky to be operating in startup hotspots that offer incredible talent pools like that from the University of Waterloo. We’ve been very appreciative of the support we’ve been given by our mentors in the Waterloo Region and in Mountain View. Our Communitech Executive-In-Residence, Dave Littwiller has been absolutely awesome to work with. Of course, YCombinator (Paul Graham and the amazing team of partners) have offered incredible mentorship and guidance to our team through our participation in the program, as well providing us opportunities we may not have gotten elsewhere. As for business role models, Ali Asaria from Well.ca is definitely someone we look up to. Ali has built an incredibly successful business by bootstrapping his venture and we respect this tremendously. The airbnb founders are role models to us as well. They have truly built something special and worked insanely hard to get there, including selling Obama O’s and Captain McCain’s cereal boxes to fund their startup. We’re fans of passionate, determined people who will hustle to make their idea happen. We’re focused on building out our retailer network to maximize convenience for our users and getting more BufferBox units on the ground! We’ve committed to unleashing 100 BufferBoxes over the next year in Toronto alone (and we’re of course looking to other urban centers in North America). Love what we do? Thank you! we need your help here.